Carnival Corporation has announced it has signed a multi-billion dollar contract with Meyer Werft to build four next-generation cruise ships. The ships on order form part of the previously announced memorandum of understanding with shipbuilders Meyer Werft and Fincantieri S.p.A for nine new ships between 2019 and 2022. The 180,000 gross ton cruise ships will each have a total capacity of 6,600 guests, approximately 300 passengers greater than the capacity of Royal Caribbean’s 225,282 gross ton Allure of the Seas, the world’s largest cruise ship – until sister-ship Harmony of the Seas launches next year. This capacity, the greatest in the industry, will be made possible through “innovative new ship design” and “more efficient use of the ship’s spaces” according to Carnival. The new vessels will also be the first in the cruise industry to be powered at sea by Liquefied Natural Gas (LNG). Considered to be the world’s cleanest burning fossil fuel, it will eliminate emissions of soot particles and sulphur oxides both in port and at sea. The vessels will feature dual-powered hybrid engines with LNG used to generate 100 percent power at sea. Two of the vessels, to be built at Meyer Werft’s shipyard in Papenburg, Germany, will head to Carnival’s German arm AIDA Cruises. 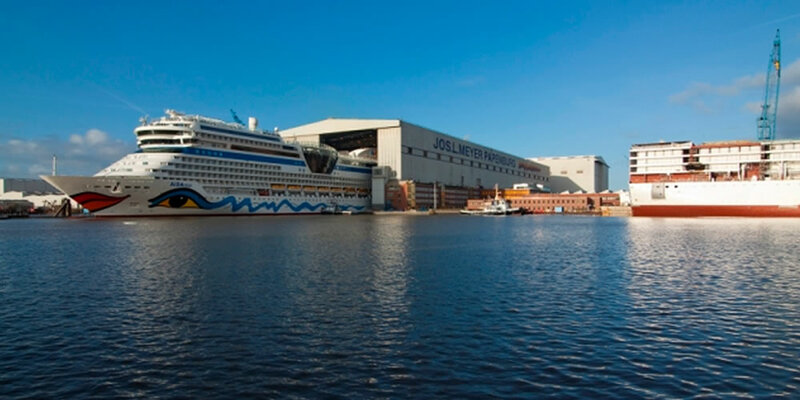 The remaining two vessels on order will be built in Turku, Finland although Carnival has not revealed which brand (or brands) will operate these cruise ships. Carnival Corporation CEO Arnold Donald said “We are looking forward to executing on the next step in our fleet enhancement plan. At a cost per berth in line with our existing order book, these new ships will enhance the return profile of our fleet. These are exceptionally efficient ships with incredible cabins and public spaces featuring a design inspired by Micky Arison and Michael Thamm and developed by our new build teams.” Arison is chairman of the board of directors for Carnival Corporation and Thamm is CEO of the Costa Group, which includes AIDA Cruises and Costa Cruises. Earlier this month Carnival Corporation announced details of a new brand called ‘fathom’ which will use P&O Cruises’ Adonia to offer voluntourism cruises, initially from Miami to the Dominican Republic. UPDATE: Carnival Corporation has since revealed that the remaining two ships to be built in Turku, Finland, will be operated by Costa Cruises.